Asmaradana derived from Asmara and Dhana. Asmara is the name of the god of love. Dhana is Dahana derived from the word which means fire, or Dana meaning to give or gift. In Javanese culture there is an old classic poetry called Asmaradana, a poetry that has to be sung when read. In Malay tradition Asmaradana is the classic love story. Some people defined it as the purest love that given without expecting to be loved. But the essence of this word is Love. I love everything about asmaradana, the sound when you say it, the story behind it, the meaning and all the things about this little word. 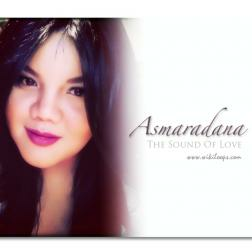 I called this album Asmaradana, because all the tracks that I picked for this album is about that beauty feeling of love. Thank you for everyone who create the song and involve on these album, from the deepest of my heart....Thank you! I've also heard this album during a morning walk with the dogs through the gray and foggy morning of New Year's Day. and NEVER have I encountered an Alice. Such a gifted songwriter, vocalist and player. And a nice person. Keep flying to the sky Alice. So glad you found WikiLoops! And love is always a good thing to sing about! You have made a lot of really great songs with such a high delivery! Way cool that I could be part of that in a lot of songs!